1. Claire’s sentence is an elegant post-structuralist paradox and we can spend forever talking about what it means. I think each one of us will interpret it a bit differently; it’s one of those ephemeral statements that says more about who you are and how you think. Post-structuralism defies definitions; you ask a post-structuralist, “what do you mean?” and they’ll respond with, “what does it mean to you?” Which makes perfect sense (relatively speaking, since nothing truly “makes sense” in a post-structuralist world, but that’s a different post). An author-centered construction of meaning is exactly what post-structuralism positions itself against. I suspect that this is Claire’s goal: expanding our understanding of, and our struggles with, language. 2. So where does this leave us? Not necessarily looking for definitions or meanings, but approaches, processes, situations, examples, and interpretations. Not “what do the words mean?” but the ineffable “why” and “how” of meanings. What does it mean to mean? Why are there multiple meanings for any one particular word or image? How do misunderstandings happen? 3. Which leads us to the above image, a recent cartoon from the New York Post. 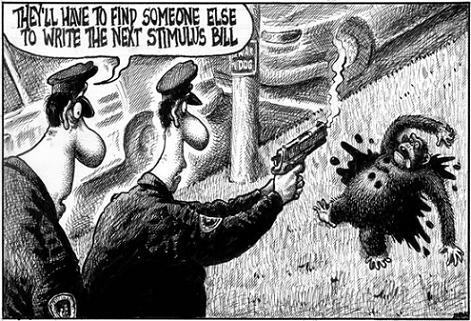 “They’ll have to find someone else to write the next stimulus bill,” reads the caption. A policeman is seen having just shot a chimpanzee. What does this cartoon mean? Do the author’s intended meaning(s) matter, or can unintended meanings take priority? What other kinds of intentions populate those words/images? 4. What does the chimpanzee represent? The chimpanzee that was shot in Connecticut? Writers of the stimulus bill? Or, as Rev. Al Sharpton argues, Barack Obama and African-Americans? The first two interpretations are fairly straightforward and negotiable. The last one, however, leads us to the realm of the non-negotiable. Such an act could not be condoned by any mainstream publication without severe backlash. 5. So what does it mean to negotiate the non-negotiable? One interpretation is this: a multiplicity of meanings can be constructed from any single word/image, any of which may be contradictory. One person’s meaning may not correspond exactly to another person’s — if language was as simple as “this is exactly what I mean” then we’d live in a very different world (a very bland world). Rather, meanings infinitely extend from the past and towards the future — one conversation may be part of a larger dialogue in which the same ideas get reiterated in new contexts (cf. Bakhtin). When looking at the cartoon above, we’re not just thinking of what the author meant — we’re thinking about the history of Blackness in America, and the echoes of racism bearing down upon modern language. The negotiation of the non-negotiable doesn’t just happen on the individual scale — what the author means and what the reader interprets — but on the cultural scale: is the cartoon acceptable? What does it say about the portrayal of African-Americans in the media? In what ways does racism still permeate throughout language? “As a living, socio-ideological concrete thing, as heteroglot opinion, language, for the individual consciousness, lies on the borderline between oneself and the other. The word in language is half someone else’s” (Bakhtin, The Dialogic Imagination, p. 293). e. Very interesting exploration of the ineffable. c. What makes this even more suspicious to me is the title of the response, “THAT CARTOON”, which of course could just be referring to the cartoon in question, but might also be echoing the way John McCain referred to Barack Obama in one of their presidential debates, by pointing over in his direction and saying “that one”. great example of the struggle for meaning, the attempts at negotiating what can and cannot be said. thanks, Youki, for showing the way. Already talking about the negotiability or non-negotiability of certain meanings is going against the grain of many people’s habitus in this country. But the time is certainly ripe to dare otherwise !